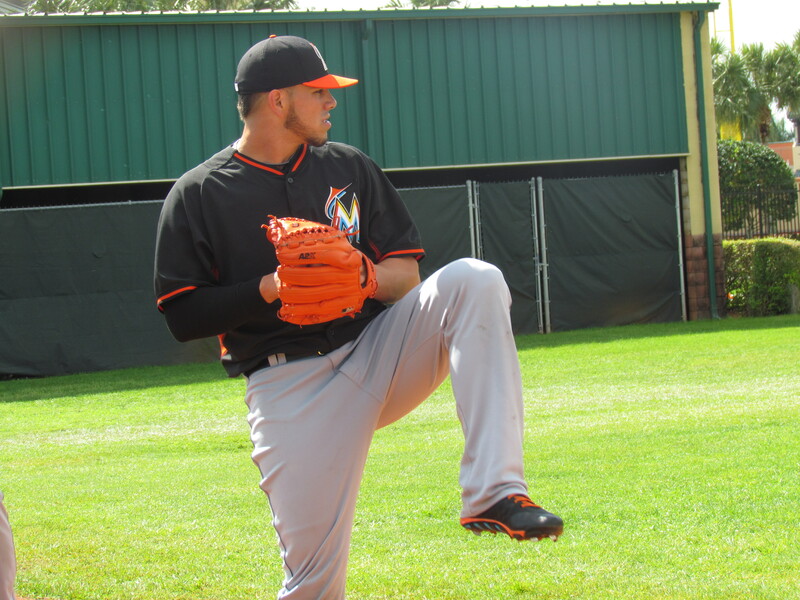 1) Jose Fernandez is progressing well in his recovery from Tommy John surgery. The Marlins still hope his return will come in the middle of June. Beat writer Joe Frisaro pointed out that the window for his return begins on June 15, when the Marlins host the Yankees. ESPN, anyone? 2) Giancarlo Stanton still hits long home runs. Against the Cardinals this week, Stanton smashed a fly ball to deep left-center field. It landed on the second-story balcony of the Marlins’ clubhouse. I’ll estimate the distance at 440 feet. 3) Michael Morse, Dee Gordon, and Martin Prado, who all joined the Marlins in the offseason, will join Adeiny Hechavarria in Miami’s infield. They’re all having productive springs with no news being good news. Marlins starting pitcher Jarred Cosart is being investigated by Major League Baseball for allegedly exchanging messages with a gambling firm through Twitter. All reports from the MLB indicate that the pitcher is cooperating fully with the investigation. Cosart, who was traded to Miami from Houston at 2014’s trade deadline, claims that his Twitter account was hacked. He has deleted the account. He is innocent until proven guilty, but if it is found that Cosart did indeed make wagers on MLB games he could face serious punishment. The penalty for betting on a baseball game in which he is not involved is a one-year suspension. If he made a wager on his own team’s game, he faces a lifetime ban. This is one of the stranger off-field stories I can remember involving the Marlins. Cosart, though, appears genuine in his cooperation and I personally doubt he was involved in any gambling activities. There will surely be crowds at Nationals Park this season–especially for all the giveaways. against the Marlins at Nationals Park. 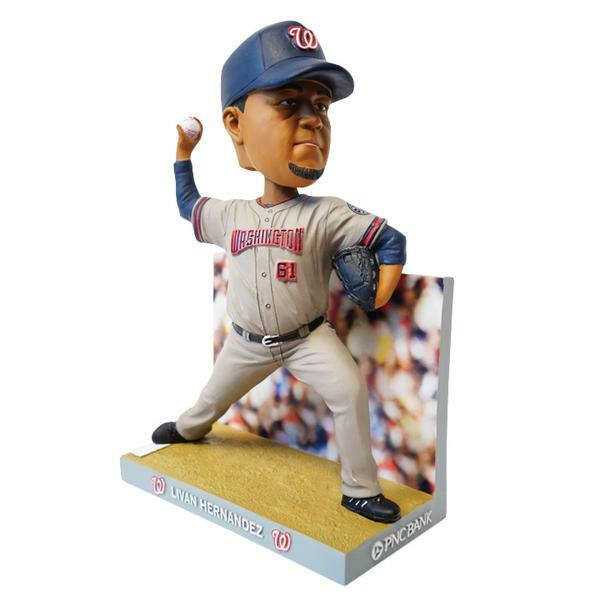 Hernandez’s figurine is the first to be given out in the ‘Great Moments in Nationals History’ bobblehead series celebrating the 10th anniversary of the Washington Nationals. The bobblehead depicts the first pitch in Nationals history, delivered by Hernandez in Citizens Bank Park in Philadelphia on Opening Day in 2005. As such, Hernandez is depicted in the Nats’ away jersey, the first time an away jersey has been featured on a Nationals bobblehead, according to Scott Allen of the Washington Post. Hernandez made memories for both the Nationals and Marlins during his career. He was on Florida’s 1997 World Series Championship team. He played for Washington in two separate stints–from 2005-2006 and from 2009-2011. 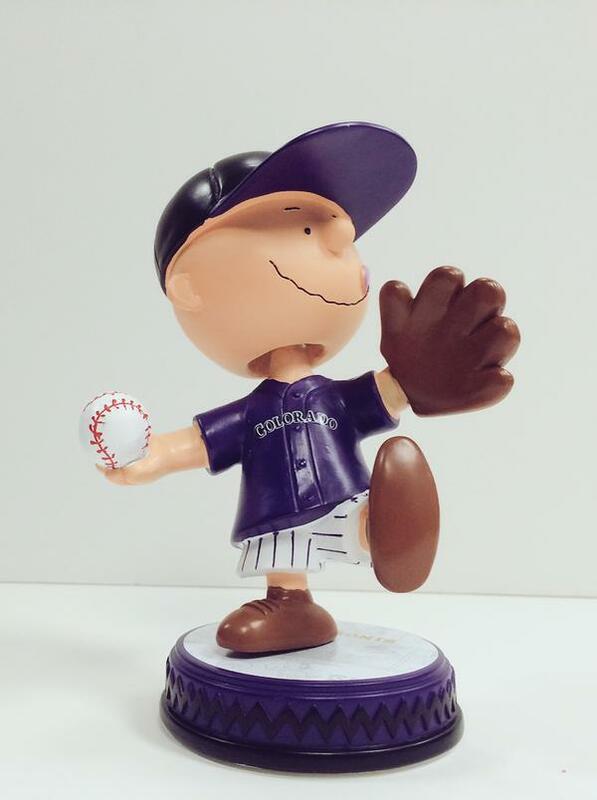 The Colorado Rockies are selling a bobblehead of…Charlie Brown? Coors Field’s high altitude makes it conducive to long home runs and overall hard-hit balls. That, coupled with the Rockies’ unimpressive pitching staff this season, inspired the tweet from Cespedes Family Barbeque. Whether or not that tweet inspired the Charlie Brown bobblehead is anyone’s guess. If someone in the Rockies’ marketing department had the foresight to see the tweet and design a bobblehead (and the gusto to make fun of the home team), I may have to make a trip to Denver this summer. Skittles. That’s all I have to say. It sounds to me like Skittles wants to be the official sponsor of walk-off wins at Marlins Park this season. In the last two seasons, it has become a tradition for the Marlins to throw around water when celebrating walk-off victories. So Skittles may just want to add some color to that party. I suppose only time will tell, but I predict that Skittles wants Dee Gordon to throw around the rainbow candies on the field in celebration. That’s all I’ve got for the month of March. Make sure to watch Dayton’s women’s basketball team on ESPN today at 2:30. They’re in the Sweet Sixteen for the first time ever. And if you’re feeling really adventurous, read about them on FlyerNews.com. Ironically, their women’s basketball reporter is also named Steve Miller. The Marlins open the season on April 6th at home against the Atlanta Braves.